This is my Quilt As You Go Dresden table mat. My tutorial for the table topper is here. The tutorial shows how I make my Dresden Plates from charm squares (or 2 1/2" strips). Here's a photo of the table topper without the centerpiece. 1 1/2" half square triangles from charm squares found here. I made this tiny tumbler quilt from little 1 1/2" blocks that I won from Kathy at Inspired by Antique Quilts blog. 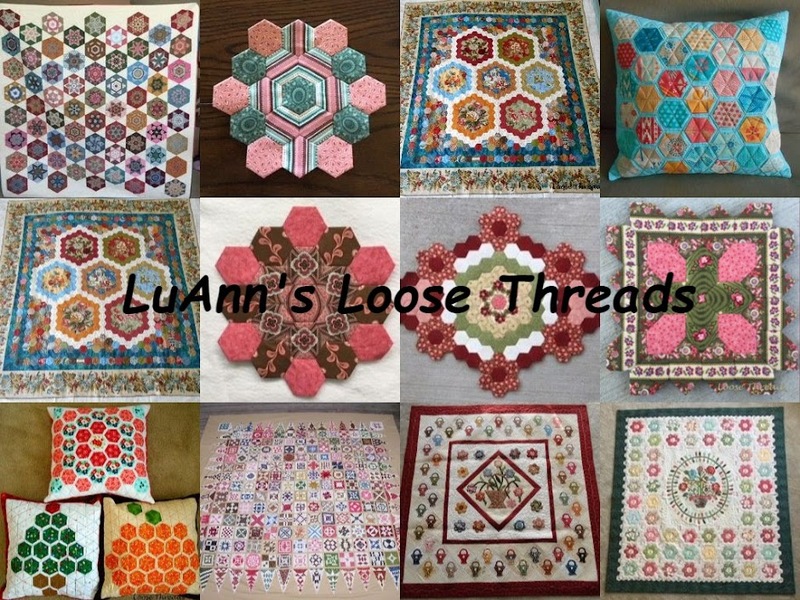 The tumblers are hand pieced and hand quilted. I miss Kathy's blog. This is a little quilt that I made from my tutorial From Squares to an On Point Quilt found here. This is another great use for charm squares. 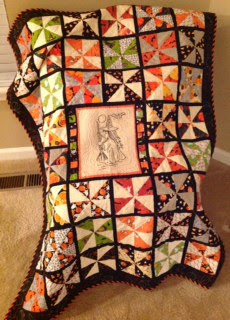 I made this quilt from another of my tutorials called Pinwheel Blocks from Charm Squares found here. The pinwheels also use charm squares. Here's a little better photo. I won the center redwork pattern from Gay at Sentimental Stitches. You can purchase it there. This isn't Halloween, but I have rolled up some of my smaller quilts to display them in this basket. The one hanging over the basket was from a Humble Quilts quilt along. The small flying geese quilt was made from my tutorial here. 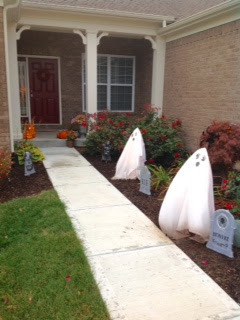 I always decorate the outside, too. There are lights on the bushes that don't really show up in this photo. The ghosts are made from my Tomato Cage Ghost tutorial here. We've had a frost already, so my chrysanthemums have seen better days. 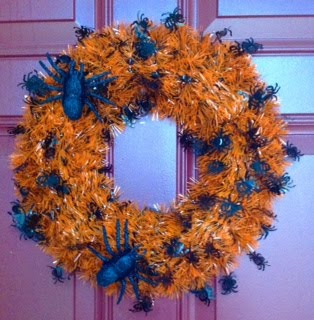 The color on this photo is off, but this is my front door decoration. All of my tutorials can be found on my sidebar. I hope you will give at least one of them a try. I love finding different uses for charm squares. H A P P Y H A L L O W E E N!!!!!! Hi Everyone I've been away for awhile. Part of the time was spent catching up on sewing projects and some knitting. We were on vacation for over a week, and toward the end we both got sick. I haven't had any kind of cold, upper respiratory thing for about 2 years, and it's taken me awhile to snap back and feel human again. In my last post, I showed you the Smitten block kits that I've cut. Here are 2 that I sewed while on vacation. It's too dark now, but I'll take photos and show you my progress soon. The Smitten pattern is by Jen Kingwell. I'm still sewing 2" six pointed stars. I really love fussy cutting and sewing these blocks. The pink/rose star fabric in the block below is a fabric by Sue Daley. The red fabric in this star is a Sue Daley fabric. The other two are from my stash. I love spending time in the Smoky Mountains, and I never tire of this view. Here is a photo from the same place. You can see the clouds rolling in and the tops of the mountains are barely visible. I spent a lot of time under this striped umbrella during vacation. It is in front of the Marble Slab Creamery. Yes, that ice cream was purely for medicinal purposes to heal my sore throat. That's Starbucks across the way. That Pumpkin Spice Latte was for the congestion. That's my story! I'll try not to stay away so long next time. I've done a lot of stitching, and I'll take photos and show you soon. I hope you've been stitching, too.